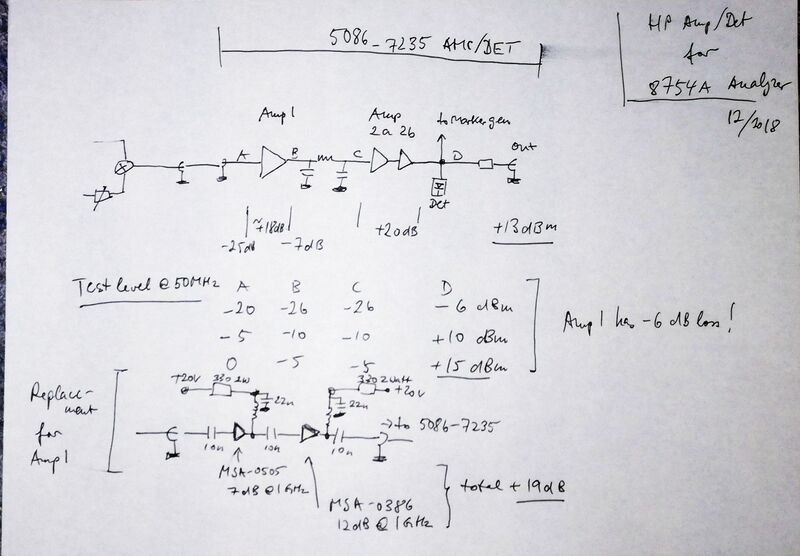 Some performance validation of the recently fixed 8754A revealed that the output is leveled at 0 dBm, but it doesn’t provide any more than 2 dBm, when you turn the knob to higher levels… it should provide at least +10 dBm leveled, and +13 dBm typical. So, what is wrong? The signal source is mostly located on the A7 assembly, two VCOs, a mixer, and several amplifiers and levelers. The osciallator is working, as we can see, but the amplifier circuit, a golden box, number 5086-7235, is not amplifying sufficiently. HP did not consider this field-repairable, so the manual only has some rough information about its contents. To find out more, we need to crack it open – it is not welded, but glued with a generous amount of silver epoxy. From right to left, the preamplifier, a filter (LC low pass to remove the VCOs and higher mixer products), and the power amplifier with detector and a -20 dB tap for the PLL-marker circuit. I checked all the bias voltages and currents, these seem OK. 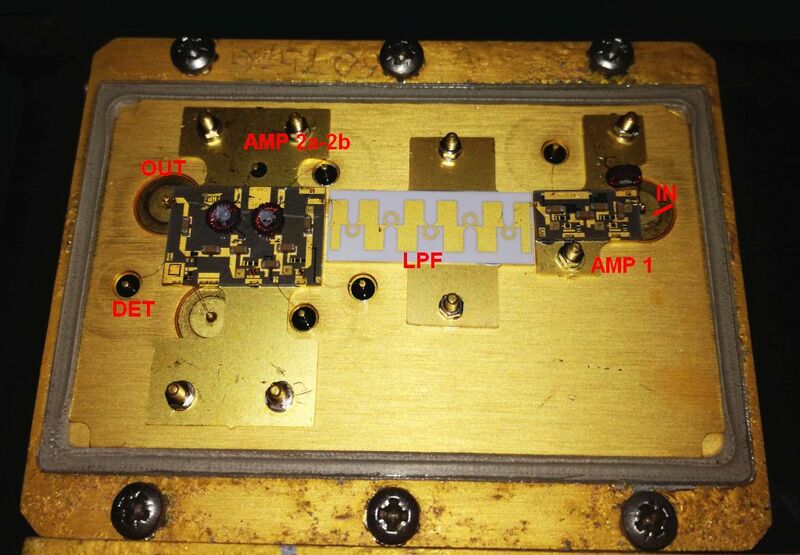 The main amp substrate (sapphire?) has a crack, but is it not fully going through the material, and the gold layer is thick, and the crack is not cutting through the critical sections. 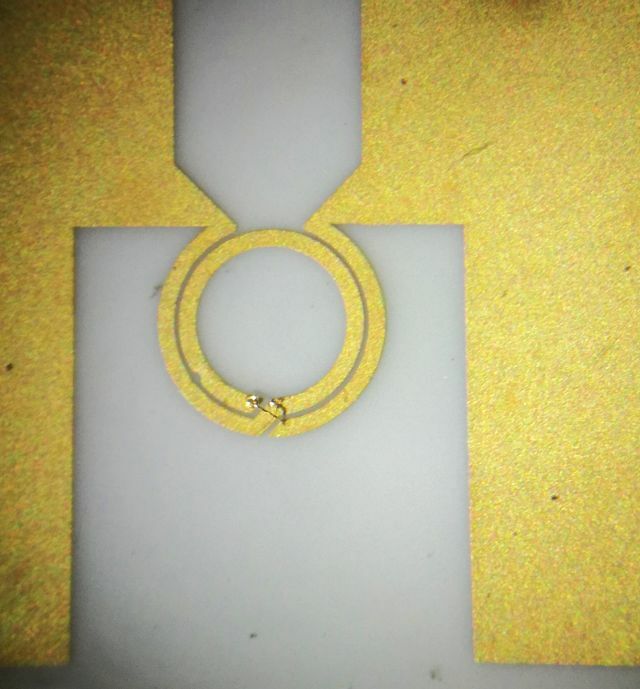 Various testing has been performed, to find out the power levels, using a 50 MHz precision source, and a fine tipped probe to check the levels on the substrate (using a microscope, and a steady hand to avoid damaging the bond wires). 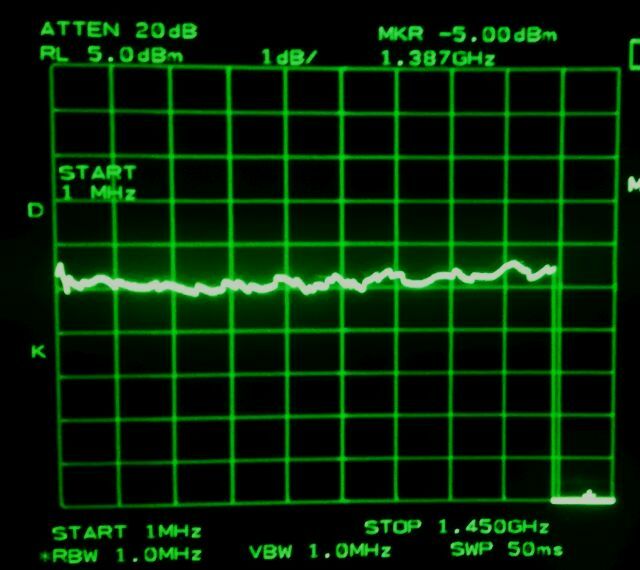 From the data it is obvious that the preamp is not amplifying, but absorbing power. This is good and bad, because the final amp needs to provide clean amplification to avoid spurious, so I don’t want to mess with it, and there is also the detector diode, which is essential for the flatness of the unit, also something that is not easily fixed, if you introduce some parasitic resonances or the like. 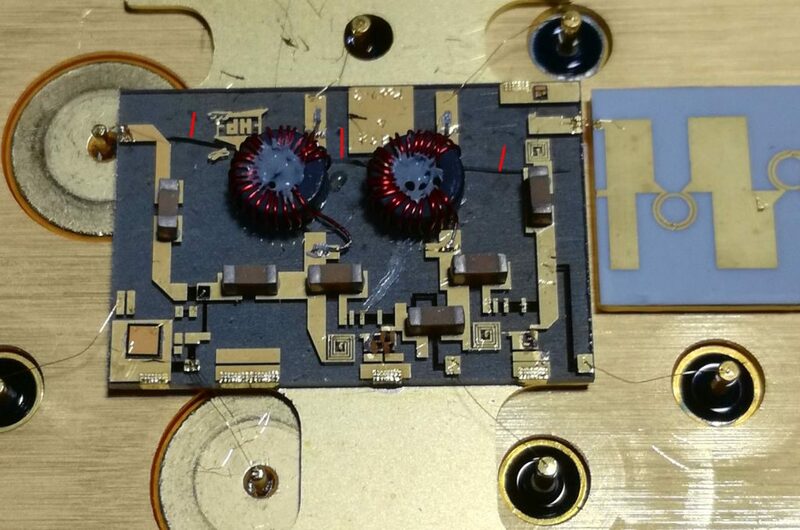 The fix – scraped off the transistors and most of the gold from the preamp, and soldered a short wire across the substrate, I think it is about 50 ohms impedance. Then, I inserted a set of 2 integrated microwave amplifiers (a MSA-0505 and MSA-0386) to provide about 19 dB gain. The maximum output +13 dBm at virtually all frequencies (a small dip around 1 GHz). 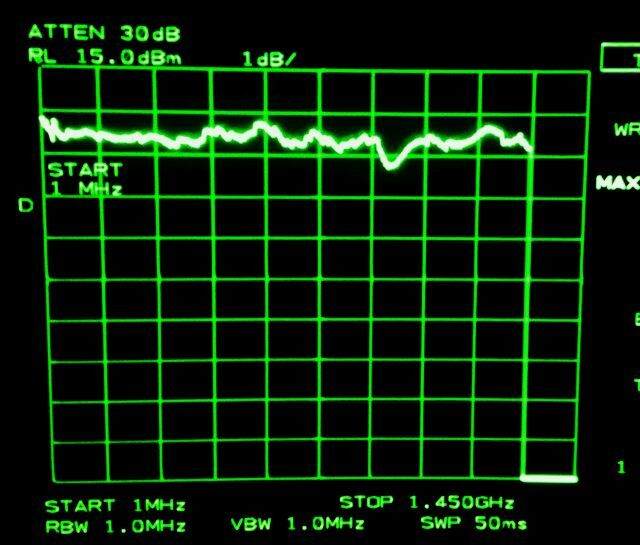 A test at various power levels, with a good spectrum analyzer (don’t have a calibrated power meter here, but this analyzer is pretty well calibrated). Amplitude is 1 dB per division. 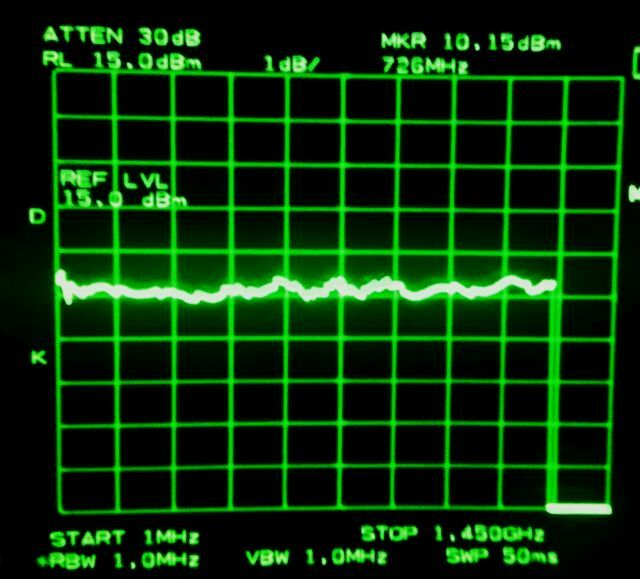 The 8754A is calibrated at 0 dBm and 10 dBm, at 50 MHz. 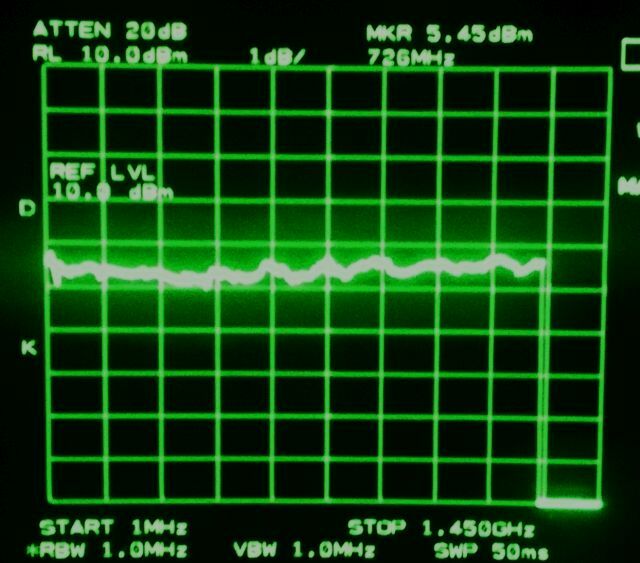 0 dBm leveled output, 1 to 1400 MHz… pretty good. 10 dBm output, also, great flatness. Finally, at test at 5 dBm – it’s accurate and flat! Now, we will let this run for several hours at maximum output, to see if the repair is permanent, then the amps will be sealed with epoxy (just plain epoxy, no silver epoxy).